After moving into my house here in Florida I set about trying to decorate it to suit the eclectic diversity of my possessions. I’d traveled extensively for years and many of my memories were tied to those travels in the form of furniture, statuary, paintings, masks, tapestries, etc. The trick was to try to keep my home from looking like the hodgepodge it actually was, and not, too terribly tacky. I am generally pleased with the way it all turned out, but I have to say, one room in particular presented a huge challenge. My 14’ x 9 ½’ one-step-down sunken sunroom. I have an open floorplan with cathedral ceilings so my main living area has a living room with an island bar separating it from my kitchen and breakfast area and the sun room is located at one end of my living room with the step down and triple sliding glass doors separating the two rooms. Each sun room side wall consists of patio type sliding glass doors. One side leads to the breakfast room and the opposite one leads to my office. The fourth wall is the back of the house outside wall which has two, 4 foot-wide jalousie windows starting two feet above the floor and going up to the ceiling, a glass single door/screen combo and one more small window, also starting at two feet above the floor and going up to the ceiling. I explained all this so that you could realize that at least 90% of the sunroom “walls” are clear glass doors and I had no idea how I was going to place any useful furniture in it. My dilemma was I needed more walls, but I also needed the light the sunroom provided to brighten up the surrounding living room, office and breakfast room. Part of the solution came when a friend gave me her no-longer-needed room divider made of knotted jute cord. And that idea started me looking for other room dividers that were see-through. I found two “curtains” made of 2” coconut shell discs strung with black cord. The two curtains together were the width of two of the sliding glass panels leading to the living room. If all the sliding panels were drawn back or open, the three panels stacked into a recessed area at the end of the wall. If closed or partially closed, the recessed area was a blank single-door-size wall. I decided to close the panels of the living room glass doors and leave one width doubled and open to walk through and then faux paint the blank recess area to look like a rock wall. Having never attempted painting rocks before, I wasn’t sure I could pull it off, but I wanted to give it a try. I wanted the rocks to look stacked up and maybe cemented in place, but I was having trouble visualizing different rocks. My yard doesn’t have any rocks in it, so I roamed around the house searching for something that looked like a rock. I found what I needed in the kitchen. An Idaho potato! Don’t laugh; it really looked like a rock. Ha! So I got my paints out and started painting with one hand and holding and turning the potato with the other. After my painting project was done about a week later, I placed my reading chair and a small table against the coconut shell curtain and sliding glass panels between the sunroom and living room. A fountain was placed in front of the “rock wall”, and a knurly tree that I made out of a fallen limb from an outside tree went in the corner at the entrance to my office. The rest of the decorating project fell into place after that. I placed a rustic-painted ice cream table against the glass doors going into my office. My friend’s knotted curtain acts as a backdrop, and I put a wicker storage bench below the jalousie windows and a wicker tower cabinet in the corner near the entrance to the breakfast room. After walking past that rock wall for years now, I’ve decided I’d like to try to make the rocks look a little more three dimensional by adding shadows in and under some of them and by darkening grout. I still don’t know how to do it, but I’d like to give it a go. Anyone have any suggestions? I’ll follow up with more pictures later when I finish. Please cross your fingers for me. FYI, I have noticed that the grout and some shadows look darker in my photos than in real life. Hopefully, I can make them more real looking. A few days ago, my son came to help me put up Christmas decorations and, wanting to reward him, I offered to take him and his girlfriend to dinner at a restaurant of his choice. He chose a local family-owned German restaurant here in coastal, west-central Florida. We go there often and are friends with the owner and his lovely wife who immigrated here a number of years ago. Just stepping inside their restaurant always makes us feel as though we have traveled back in time and are journeying down memory lane, once more. We were a military family and we lived in Germany for three years. Our home was in Morbach snuggled in the Hunsrück Mountains near the Mosel River and not far from Luxembourg. At the time, it was a rather small village with delightfully helpful people and was not an area known much to tourists. So, most of our friends were either fellow Americans or German neighbors or people we met while we were there. Every chance we got, we traveled around the country, trying to cram in as much history, art and culture as possible and as I looked around the restaurant at all the beautiful objet d’art that decorated the rooms, I was reminded of some of those experiences. Folklore fascinated me and how it was manifested in artwork and in particular, woodcarving. In the Black Forest, I met an artist who sold me three of his works that he had hand carved. He explained that the styles might be different in each, but they were based on German fairy tales, folklore and history. The first object was a witch with a cat sitting on her shoulder. It was 8 ½” tall and carved with large strokes of the cutting blade which, amazingly didn’t hamper the detail of her figure or face or of the little animal. This technique actually created shadows and wrinkles and character. The next object was a mask about 11 ½” tall. I was captivated by the fact that the carving totally followed the grain of the wood; the center was the tip of the nose. It had to take real planning to imagine ahead of time how to accomplish the carving. The kind of thinking-ahead required of a chess player, I thought. Amazing! And the last object was a mountain climber which measured 22” from the top of his upper hand to the bottom of his lantern. The carving technique on this work was similar to the witch with the wider carving strokes and was also rendered from a single chunk of wood, except for the feather in the climber’s cap, and of course, the metal lantern. I found it enchanting that the lantern actually lights up and hangs from the ceiling by the climber’s rope. Since then, I’ve seen this piece often copied because of its uniqueness and popularity. Germany will always be a special place to me. I have wonderful memories of good times, good people, and good experiences that I shall cherish always. Opportunities to spark those memories again and again abide in my local German friends. Thank you, Dagmar and Uwe. Do you have a place or people that remind you of a cherished previous time in your life, just by going there and seeing it or them? I’d love to hear. Children always seem excited when they see their teachers in a different environment outside of school. They often wonder if teachers do anything other than teach and grade papers. They always ask teachers what they do in their off-time, because in the student’s mind the teacher lives at the school. Even though it really seems that some do, most of us lead exciting lives, married, raise kids, and work other jobs (is writing another job?). What if teachers did do more than teach? What if the middle schoolers we worked with were actually alien rather than just acting as if they were from another planet? What if….? The above is the proposed forward to my latest submission, Secret Lives (of Middle School Teachers). Secret Lives is my first attempt at something like a novel or rather a story other than a picture book. We are always told to write about something you know or you are interested in. So I did. Let’s see, I have spent ten months a year for the last eighteen years teaching in the same middle school. With that, I have worked around a lot of the same teachers and many new teachers that rotate through our school. Some of the personalities are unique. Sometimes the faces change, but the personalities stay the same. I’ve taught close to two thousand students. I would try to describe the normal student, but who is to say what is normal. I have had parents ask “What happened to the sweet, little girl I used to have? It’s like some alien sucked her brains out and didn’t give them all back.” Or, they wonder why their sons stopped taking showers and why hygiene now means nothing. So, I took a handful of experience (eight four-day trips to Washington, DC with four bus loads of eighth graders gives some experience), several teacher personalities, and a fascination with astronomy mixed them all together with a little humor and came out with something like a story. God gave me a little leeway and allowed me to create a planet system around a known star. In that system is a planet named after an Englishman named Nigel that I go to church with. I got to determine what the people looked like and the environment in which they lived. I also got to develop worm-hole technology. My aliens are called Nigelians (Nigel) and they are very humanoid. The only differences are their lack of noses and ears. While on Earth they wear assimilation suits to disguise their differences. They also have tufts of hair rather than a full covering. There are other differences, but maybe you can read about them later this summer. If you have ever been to Washington, DC, you may have passed by the Old Post Office. I have been to the building once and even took a group of students up into the clock tower. Most of the story takes place in DC, but the Old Post Office became the home for our school and was the center for a lot of the action in the book. I also tried something that I haven’t really attempted since I was a boy (and that was a long time ago) — free-hand drawing. In the military, I was trained as a architectural draftsman. I learned straight lines and right angles. This was something different. I did sketches, perspectives and some doodling. Eventually, I completed all the drawings except for one, which was submitted by a student. I did make some changes, but gave her the credit. I have to admit that completing this book was a lot more fun than the picture books I’ve been doing. There was more freedom in writing, in the ideas, and my thought process felt more alive. I also got to learn a lot about DC. When we continue to try something new we continue to grow in our art. And, as long as we enjoy what we do it is not a job. Keep an eye out for my new adventure. Read, write and enjoy. ***John E. Stack is the author of Cody’s Almost Trip to the Zoo, Cody’s Rescue Adventure at the Zoo, and Olivia’s Sweet Adventure. He is also the author of the upcoming books Cody and the Great Zoo Escape and Secret Lives (of Middle School Teachers). I’m getting my fifth tattoo today. Some of you may smirk at the measly amount of ink adorning my body while others will wince with dismay at the whole idea. To tattoo or not tattoo — a great way to get people talking, isn’t it? When folks hear I’m getting a new tattoo, the natural question is what am I getting? True to writerly form, all of my tattoos are literary — specifically from Alice in Wonderland. My ink-marked road began back in 1992 with the Caterpillar smoking his hookah tattooed onto my left thigh. A few years after that, I balanced things out with the Mad Hatter on my right thigh. Later on, I added the Cheshire Cat on my back and more recently, a playing card painting roses on my foot. 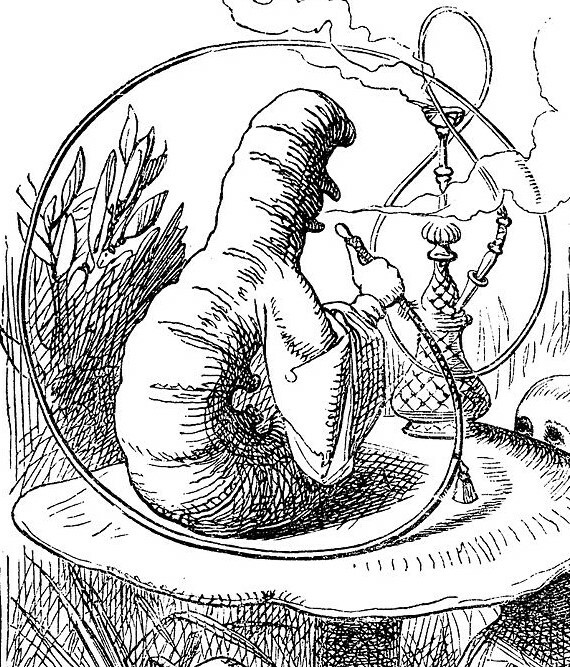 For my next tattoo, I’m branching out into Through the Looking Glass for the White Queen, along with her wonderful quote ‘sometimes I’ve believed as many as six impossible things before breakfast’. I considered the Red Queen but as I explained to a friend, the Red Queen has taken on menacing connotations since appearing in Through the Looking Glass. Anyone who has read Frank Beddor’s The Looking-Glass Wars series or watched Resident Evil knows what I mean. I’m not sure how I feel about putting something sinister on my body. Would it imply I’m sinister? Reveal my dark side to the world? This got me thinking about what drives folks to choose what they have tattooed on their skin. If you ask someone about her tattoo, you’ll hear a story in return. The story could be about the design — be it a Chinese character denoting a name, an Egyptian symbol for Osiris drawn on a napkin at a bar by a tipsy friend, or a favorite piece of art reimagined just for you. The tattooed person might choose to reminisce about the experience — perhaps the ink was drawn by a renowned artist, maybe the tattoo shop clientele was rougher than expected tinging the experience with a little fear, or possibly close friends came along as support during the session. Sometimes the story is about why she got the tattoo — it could be in memory of a parent, to commemorate a momentous event, or a reminder to be strong. The stories are as varied as the human experience. A tattoo is more than ink cut into flesh. For most folks their tattoos express how they think of themselves, who they present to the world. I’m a fantasy author and one of the first stories I remember loving was Alice’s crazy journey though Wonderland. Tattooing her world on my body tells the world a little bit about who I am and what I like. Some folks want original art on their bodies, while others sport family portraits. A gorgeous design of flowers twining around your arms could lure you to the tattoo parlor chair while your friend would rather have words from a favorite movie coiling around her arms. Oftentimes, a non-tattooed person will mutter, “I don’t know what I’d get” — I think that’s a sound reason not to get a tattoo. You’d better like what you pick — because it’s going to hurt and be permanent. Tattoo removal notwithstanding. Tribal designs, Chinese symbols, family photos, movie characters, album covers, favorite foods, a lover’s name, a child’s birthdate — anything can be mined for ideas. If someone chooses a menacing, evil design, be it historical, religious, literary, or simply violent, he is embracing a philosophy, declaring an affiliation with something disturbing. It’s a deliberate choice. Of course, the Red Queen isn’t all bad in Through the Looking Glass, but she gets bad rap since she’s often confused with the Queen of Hearts from Wonderland. You know, “off with their heads’ — that Queen of Hearts. In fact, The Red Queen even helps Alice become a queen and celebrates with her near the end of the book. Mmmm — perhaps # 6 will be the Red Queen after all. 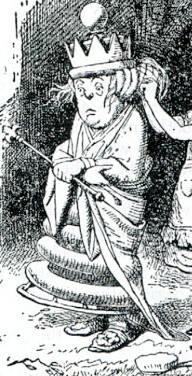 A kinder version of the character. I’d love to hear your stories about your tattoos in the comments. With thanks to Amber Hettman for the title. In addition, a shout-out to Brynn Sladky at Blacklist Tattoo (http://blacklisttattoo.com) for designing and inking tattoo number five. Tattoo # 5 or at least the original design before Brynn worked her magic. She added the ‘six impossible things ‘quote as well as some other wonderful details. I am baffled by the amount of complaining that swamps the Internet about how hard it is to write. So much that I wonder why people bother to write. There is a plethora of articles such as: Dealing With Writer’s Block, and The Demon of Procrastination etc. Procrastination I understand; it is doing what you want to do rather than something you think you must do. But writing is something I want to do, love to do, and so the things I procrastinate at are such things as paying bills, or making, or keeping, doctors’ appointments. 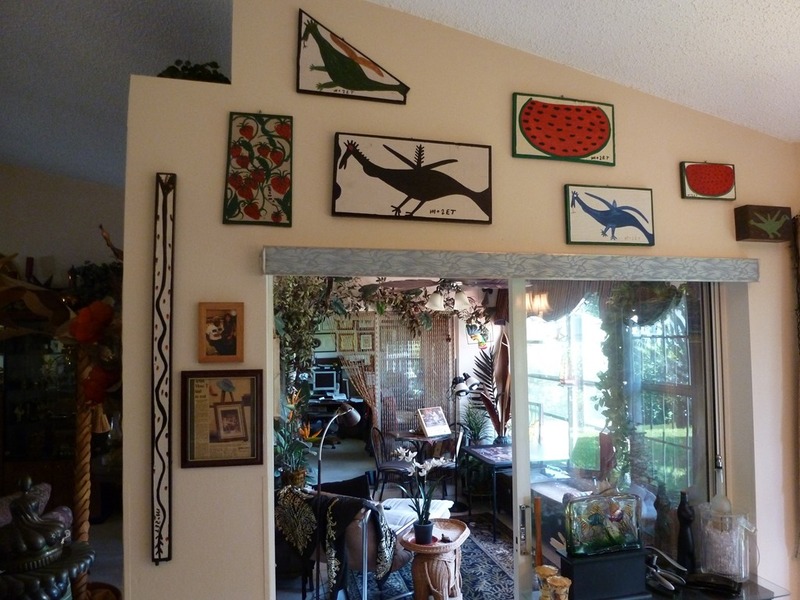 I have a mini gallery in my breakfast room devoted to a special folk-artist friend from Alabama. His name was Mose Tolliver, or Mose T, as he was known, and although he’s no longer with us, his memory lives on, as “they” say. Mose was born on July forth somewhere between 1920 and 1925 (nobody really knows for sure), and he was one of twelve children. His schooling went as far as the third grade with dyslexia hampering his ability to read and write. 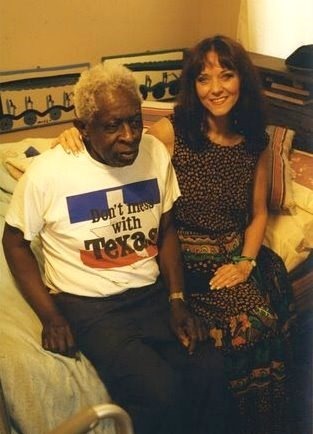 In the 1940s, he married his childhood friend Willie Mae Thomas and they had 13 children, 11 of whom survived. He worked with plants and designed creative yard plans with an unusual flair and became a respected gardener. He worked from time to time for McLendon Furniture Company (sweeping out the shipping and delivery area early each morning) and during the late 1960s he was severely injured when his legs were crushed by a load of shifting marble which fell from a forklift. The accident left him unable to walk without assistance. He was encouraged to try oil painting by his former employer, who offered to pay for lessons, but Mose decided to explore this idea on his own. Little did he know that his life was about to change, forever, again. First, he painted birds, flowers and trees and later added people and animals, all the while developing his own unique style and sense of humor. Even the titles of his paintings were unique, as was his signature with a backward “s.” He used any surface he could find: wood scraps, metal trays, Masonite, furniture, cigar boxes, even a piano, and items that were given to him. He’d display his paintings in his yard and later on his front porch and in his living room and eventually they started selling. Mitchell Kahan, a former curator at the Montgomery Museum of Fine Arts in Montgomery, AL, admired Mose’s work and set up a one-man exhibition for him in 1981. 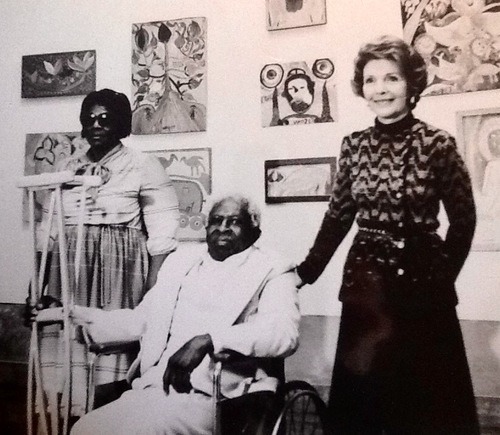 After that, Mose shared an exhibition entitled, Black Folk Art in America 1930-1980, with another folk artist at the prestigious Corcoran Gallery of Art in Washington, D.C. First Lady Nancy Regan visited this exhibition and met Mose. A friend took me on my first visit to Mose’s home on Sayre Street back in the early 1980s. After that, I used to go often. I was fascinated listening to him tell stories and show me his current paintings on the walls and his “pure paint” in its cabinet at the foot of his bed, also there in the living room. I found out that “pure paint” was gallon cans of exterior house paint, first oil-based, then later, water-based latex, which dried faster. He was so prolific, he needed faster drying paint, and whatever colors were in the cabinet were the colors of his latest art pieces. He painted them while seated on his bed, his walker close at hand. As time passed, I started taking him pieces of wood left over from my neighborhood construction sites and he seemed pleased to have some unusual shapes to use. In the early 1990s, I redecorated my kitchen and asked Mose if he’d create a painting for me of strawberries to hang in that room. I brought a bowl full for him to use as a guide, but he was more interested in eating them. Several weeks later, I visited again and there was my strawberry painting. I think it may be one of a kind. I really cherish it. But, more than that, I cherish my times visiting with this gentle man, hearing his stories and witnessing his love of life. He was truly inspirational. I was saddened to hear of his passing in 2006 at the age of 82. Mose Tolliver’s work has appeared at such renowned institutions as the High Museum of Art in Atlanta, The American Folk Art Museum in New York, The American Visionary Art Museum in Baltimore, The New Orleans Museum of Art, The Milwaukee Art Museum and many more throughout the world. To be honest, Pinterest really shouldn’t scare me so much. I’ve always loved drawing. I might even be the last person around who can claim to love Microsoft Draw. But words are my first love, and how will posting pictures get people to read them? I joined Google+ where I have another e-page at https://plus.google.com/u/0/+SheilaDeeth/posts. That link is filled with glorious images too. Then I joined a picture group and played with… words. So what do you think? I took this photo with empty space left for words, so perhaps I’ve got it sussed. And in fiction, maybe the trick’s to make sure I don’t let the background get cluttered. I’ll try to take my own advice as I work on Subtraction today, but here’s the beginning of Part 2, where I introduce Andrew’s childhood friendship with Evie. I hope it might whet your appetite, and I hope it doesn’t clutter up the tale of his future too much. Scents of green dripped around him with drifting leaves. Scents of brown kicked up from the dry earth around Evie’s feet. And emerald eyes stared out among the shadows of a black cat’s fur. “But you’ll have to, Andrew!” Evelyn’s stamping feet threw puffs of dirt around her legs. 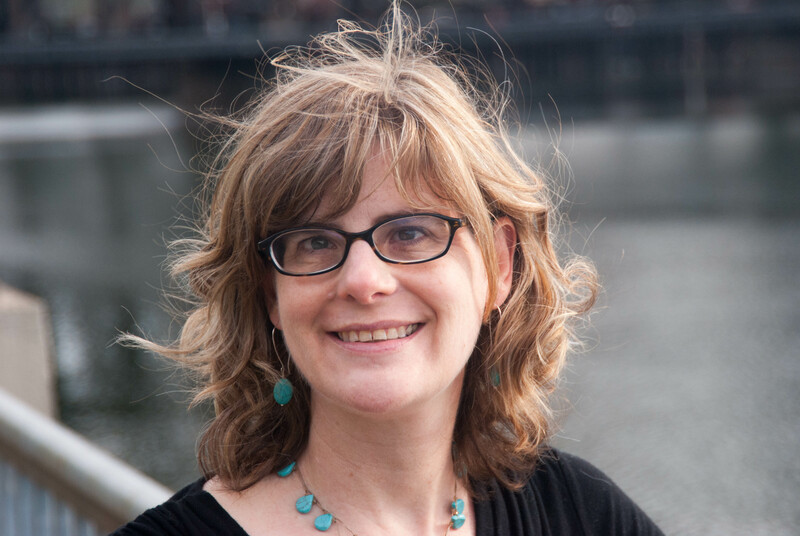 Sheila Deeth is the author of Divide by Zero, published by Second Wind Publishing. Her second novel, Infinite Sum, will be released soon, and Subtraction is the third novel in the series.